Terrorism: An Electronic Journal and Knowledge Base was initially founded by Prof. Yonah Alexander in 1998 as a follow-up to Terrorism: An International Journal published in 1977 also founded by Prof. Alexander, Director of the State University of New York’s Institute for Studies in International Terrorism. 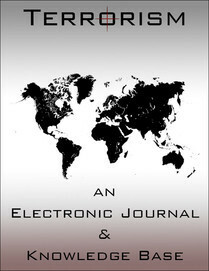 As of August 1st, 2012, Terrorism: An Electronic Journal and Knowledge Base will provide continuity to earlier studies on the “Age of Terrorism” as well as closing research gaps in the growing literature on the manifold aspects of the subject. This new electronic resource will focus on identifying warning signals on the manifold forms of terrorism in the post-9/11 era and recommend national, regional, and global strategies to confront the potential challenges to all societies. Members of the International Advisory Board and the Editorial Staff consist of academics, former government officials, journalists, and scholars. It is expected that in the coming months and years additional individuals will join this effort. Terrorism: An Electronic Journal and Knowledge Base will publish two issues annually with periodic updates as deemed necessary. Copyright © 2012 by the Inter-University Center for Terrorism Studies. All rights reserved.